It is Talk Like a Pirate Day! Soraya with an Israeli fiberglass resin knife from Mako. Soraya with a pair of original Vektor CP1 9mm pistols. We will be posting more of Soraya this month. 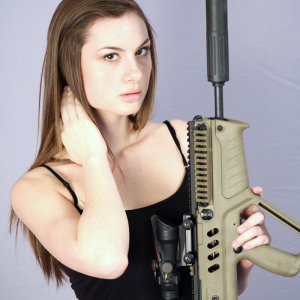 Soraya with a Belgian FN FS2000 with factory tri-rail. 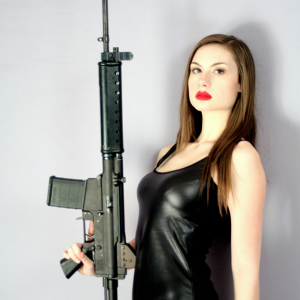 Soraya wielding the SW760 semi-auto sub-carbine built from a Smith & Wesson SW76 SMG parts kit.